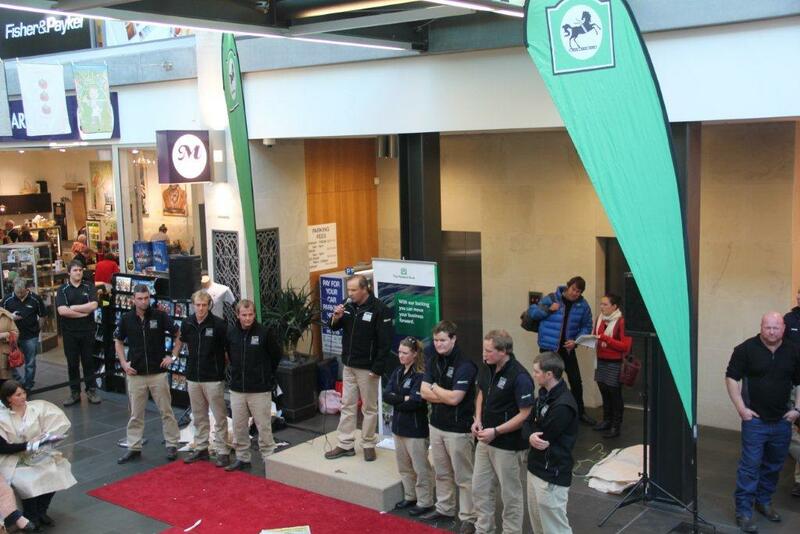 Well, The National Bank Young Farmer Contest is officially underway after a launch in central Dunedin today. The magnificent seven, this year six guys and one girl, were presented to the crowd by new contest compere Craig Wiggins (a well known voice for rodeo fans). 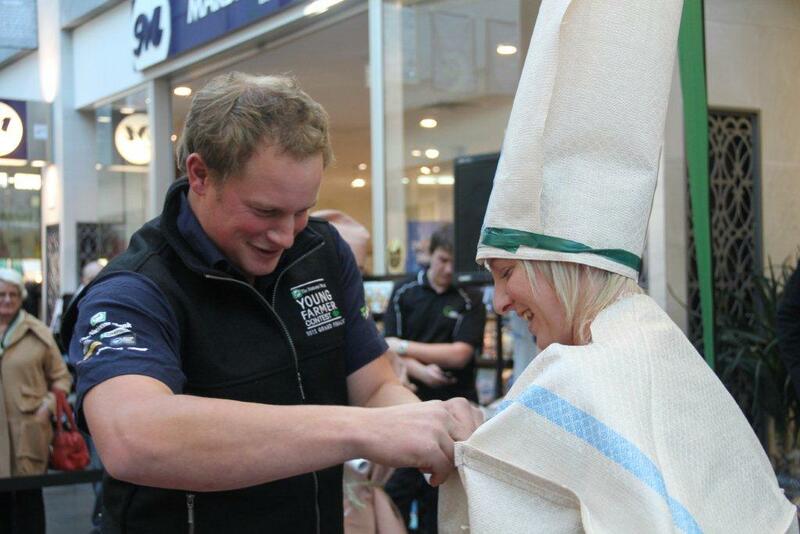 Then they dressed volunteers from the crowd with a wool fadge – complete with gladwrap and insulation tape. Compere Grant Wiggins checks out one of the ensembles! The Technical Day is to be held tomorrow at the Invermay Research Station. Friday plays host to the Practical Day of the Contest at the Forsyth Barr Stadium. The Contest Champion will then be announced at the Edgar Centre during the Televised Grand Final Evening Show which screens live on TVNZ 7 at 7.05pm on Saturday 26th May. To qualify for the Grand Final each of the seven Grand Finalists had to first win their respective Regional Finals earlier this year. Four Contestants are returning to Grand Final level in 2012; Otago/Southland’s Pete Gardyne, Sam Williams from the Waikato/Bay of Plenty Region, Tasman’s Michael Lilley and Andrew Scott from the Aorangi Region. Katherine Tucker is Northern’s representative and only the third female to ever compete at Grand Final level. Rounding off the field is Tony Dowman from the East Coast Region and Taranaki/Manawatu’s Brad Lewis. 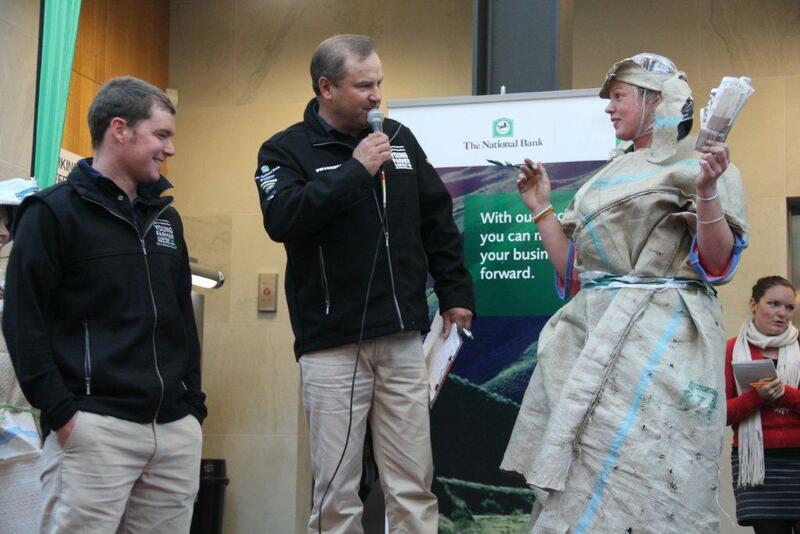 This year’s top Young Farmers are competing for the title of 2012 Contest Champion along with a generous winners prize pack valued at over $70,000 including a four wheeler, cash, fertiliser…. and new sponsor Silver Fern Farms is giving a technology package worth $15,000! Don’t worry, more sponsors will be mentioned over the next three days… someone once asked me how much it cost me to sell my arm. I was wearing a YF Contest shirt at the time which had the prize sponsors down one arm. Boy did that person get their pedigree. Without sponsors like these and people to recognise them and wear their logos, events like the Young Farmer of the Year would not exist as they do. Fist pump to sponsors everywhere! Time for bed, technical day tomorrow. Seven brains will be severely overused this time tomorrow.